The best chocolate cake I ever ate. Part of what makes working in the chocolate industry (whether it be doing tours or actually selling it) is that it is, by its very nature, a very happy product to be around. People generally have overwhelmingly positive feelings about it, and that is before you even come across them. On chocolate tours, I encourage the guests to share stories about their favorite chocolate adventures or desserts, as a way to get to know their fellow tour guests, and find a way to bond through chocolate (there’s really no better reason to bond with a human being, I think). This, of course, caused a lot of laughs among the group, but at the same time, was universally identifiable amongst the chocoholics as a clearly definable and easy-to-relate to metric. Chocolate cake is something which, when done correctly and enjoyed by a chocoholic, can create every-lasting memories in the mind of the person who enjoys it. 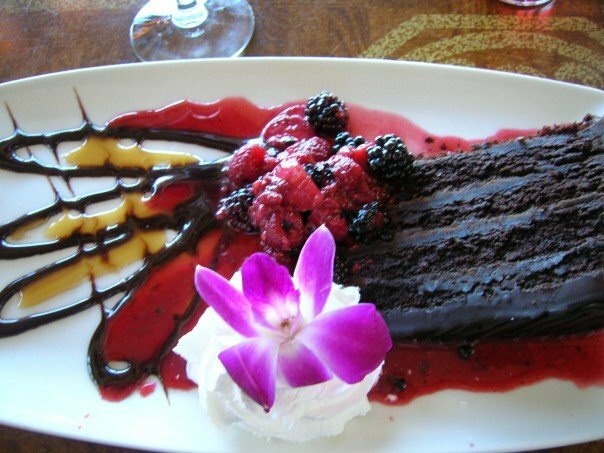 I still talk about a particular slice of chocolate cake I enjoyed once in Palm Springs, California with my friend Shawn, who also recalls the dessert with fondness. Which got me thinking. Perhaps the metric could be made even more exacting. Generally, chocolate cake has layers– the more layers the better, actually, particularly when it has that rich fudgey frosting in-between. So we decided on that chocolate tour that for most chocoholics, it would be very easy to say to a loved-one, depending on the current state of things, that you love them more than you love five-layer chocolate cake, but less than you love seven-layer chocolate cake!